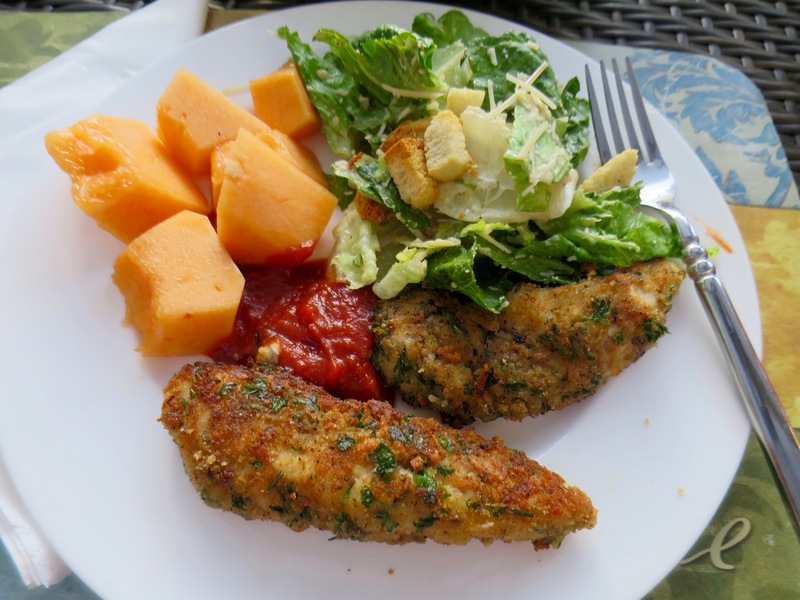 One of my kids’ most often requested meal is Chicken Tenders Parmesan – they simple love it! 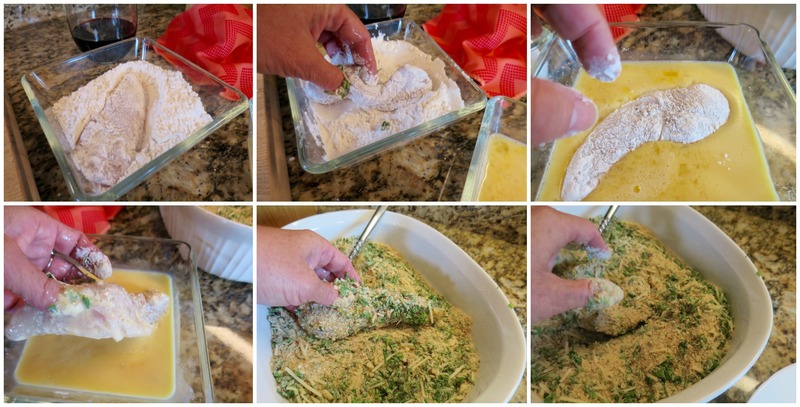 I affectionately call these Grown-Up Chicken Tenders because the parmesan cheese and fresh herbs give these tenders a most delectable flavor – one that kids and adults equally love. I do not make these very often simply because the multi-step preparation can wreack a bit of havoc on my kitchen. 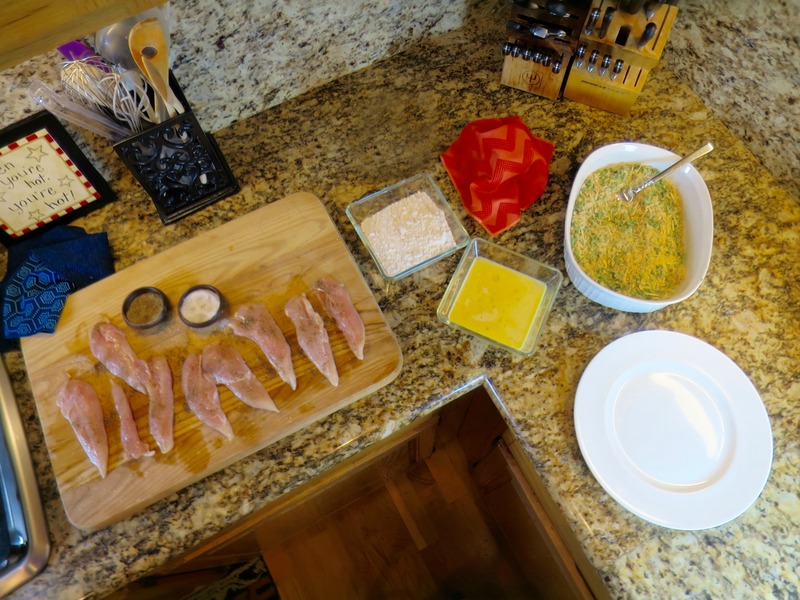 To put it plainly – this is one of those “messy” meal prep recipes! My kitchen gets a workout every single day. With our large family and my love for cooking – it seems like the kitchen is almost always in a constant stage of awry. 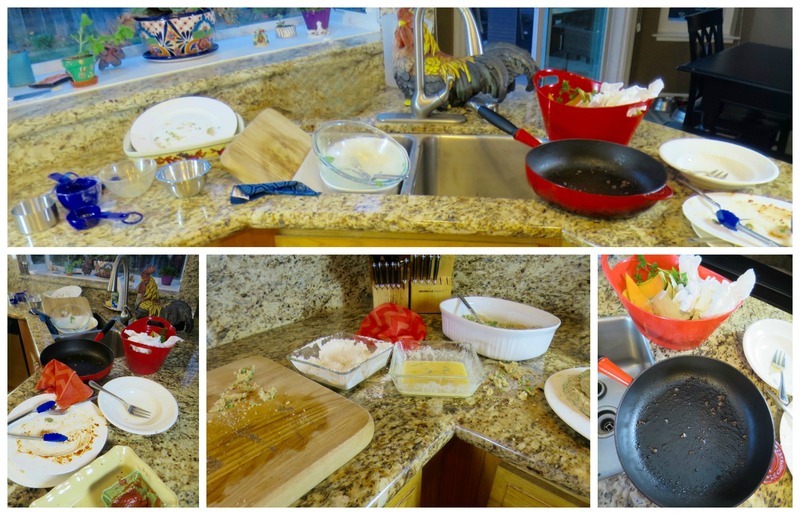 Sometimes I just look around, the kitchen is clean and I think – do I really want to make a mess again?!? When we first were house hunting and came across our home, we thought it was a perfect fit for our family. 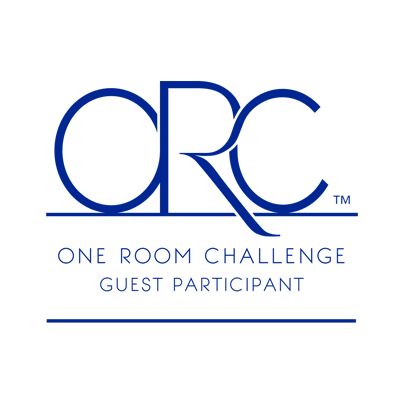 The bedrooms were large – the three kids’ bedrooms would easily house all six kids. And truth be told – this has been a great home for us. But I gotta tell you, when I first walked into the kitchen – it was, “Whoa! Granite explosion!” Out kitchen contains waaaaaay to much granite! The counters and backsplash are all granite. A very busy patterned granite. It can make you dizzy! That busy pattern can be a good thing/bad thing – depending on how you look at it. Crumbs and food splatters are very well camouflaged. You do not always see the mess the kids (or adults) leave behind. That left over food splatter and messes that are hard to see, become dried on gunk. Yuck! It is important to diligently and carefully wipe down our kitchen counters or I can guarantee you that there will be messes left behind. Unfortunately, I often have dried on gunk to scrape off my counters. 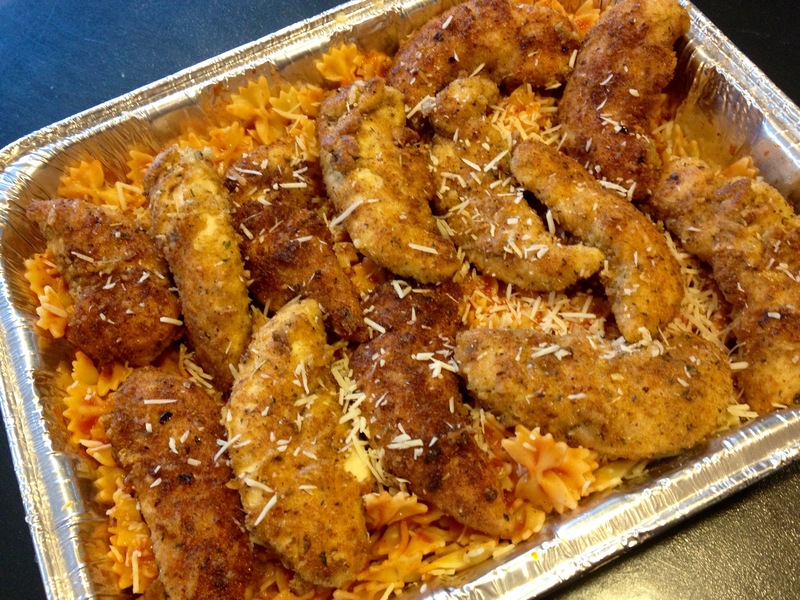 Like I said, Chicken Tenders Parmesan is a favorite family recipe and has been for years. 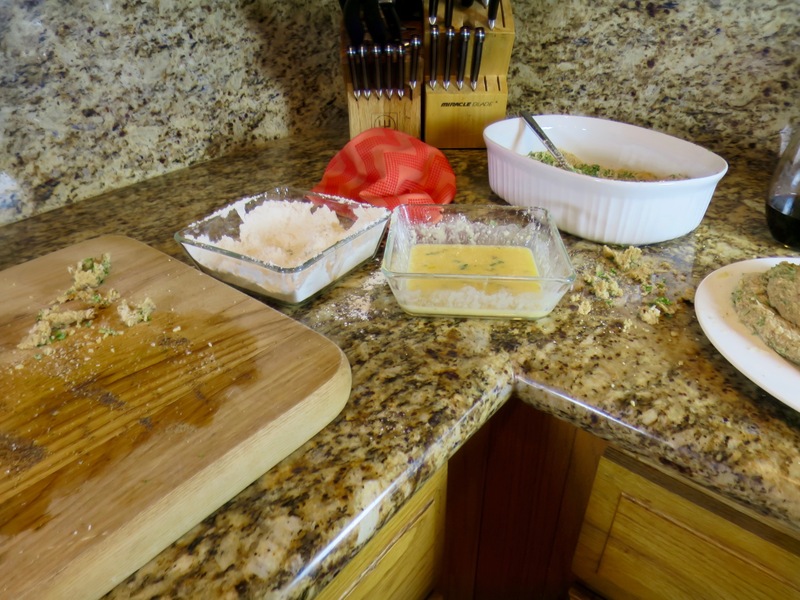 What is not so favorite is the mess in the kitchen that this multiple step recipe makes! 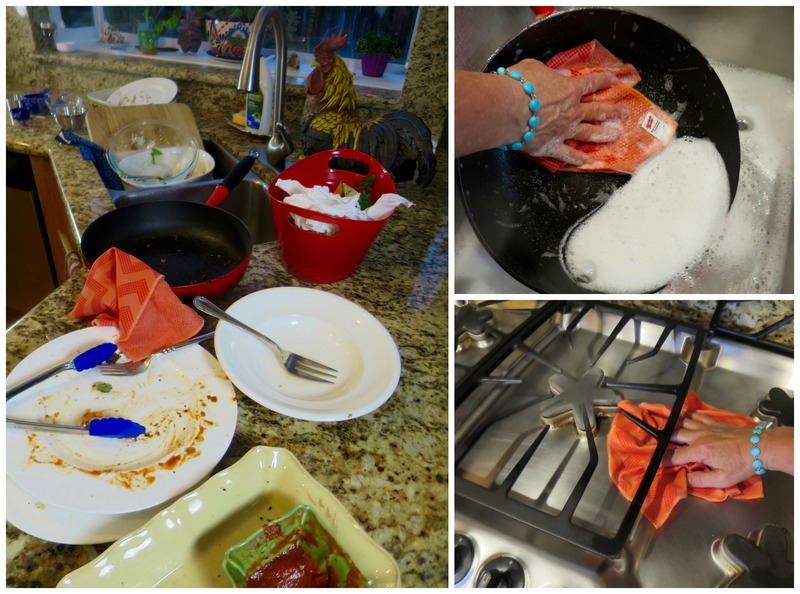 All the small bowls, the dredging, the dipping, the frying – it all adds up to one giant kitchen mess! Which is why I was really excited to discover these new dish cloths from Scotch-Brite®! Scotch-Brite® Scrubbing Dish Cloths are fully washable, reusable and sturdy! I love that the cloths have two sides – on one side it’s a premium weave cloth and the other side is has scrubbing dots – perfect for getting the dried on remnants off my counters. Perfect because it scrubs but does not scratch. 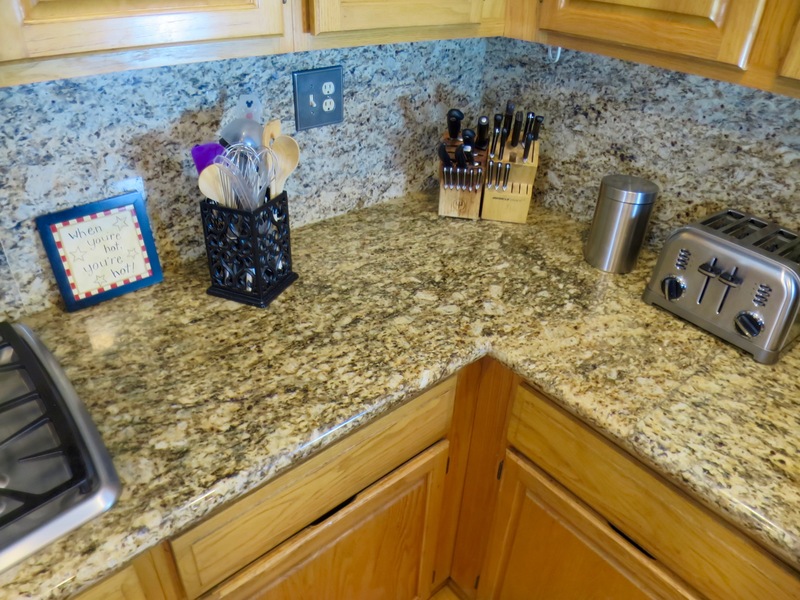 As much as I would love to change out my granite – it’s not likely happening in the foreseeable future – so I do not want to scratch the counters! I found the dish cloths at Walmart in the cleaning aisle next to my trusted Scotch-Brite sponges. These “supercharged” dish cloths are sold in packs of two and are available in tan, coral, and navy for just under $5.00. 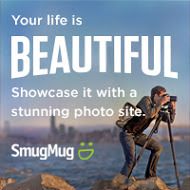 Mine cost just $4.98, and right now they are offering a $1 off instant redeemable coupon! No need to clip a coupon – it is automatically redeemed at the register upon checkout. I love my new Scotch-Brite® Scrubbing Dish Cloths! 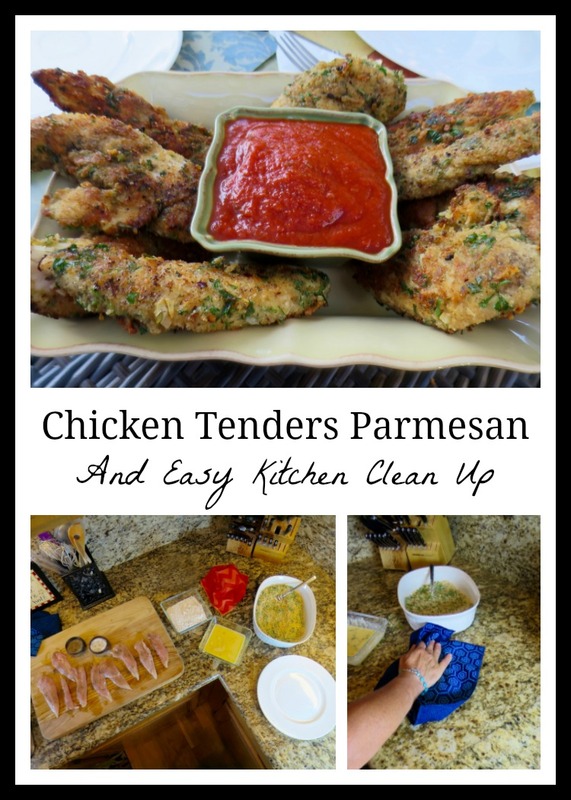 Love them as much as my kids love Chicken Tenders Parmesan! While this recipe is guaranteed to make a mess, it is delicious! 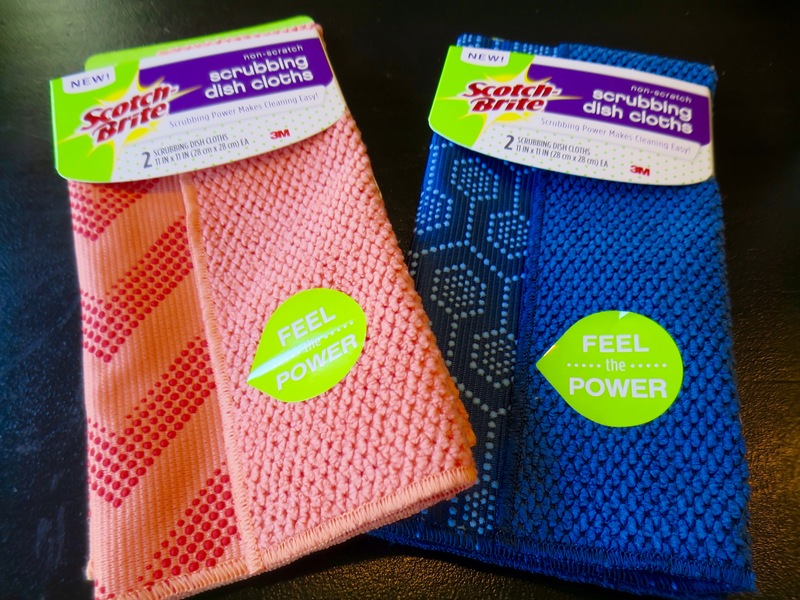 With my new Scotch-Brite Scrubbing Dish Cloths, giving me the power of scrubbing dots and a soft sided premium cloth, kitchen clean up is quicker and easier. When you make this dish, be sure to make a big batch! They make great leftovers. I have also made this a number of times when I need to take a meal to a friend. I will make a batch for us and a batch to be delivered. It is easy to deliver on a bed of cooked pasta in a disposable tin pan. I know that kids and adults all love this – so it is a great one to share. A great dish to share with a friend. Lightly beat eggs and add water, beat together and place in a shallow bowl. Place flour in a second shallow bowl. 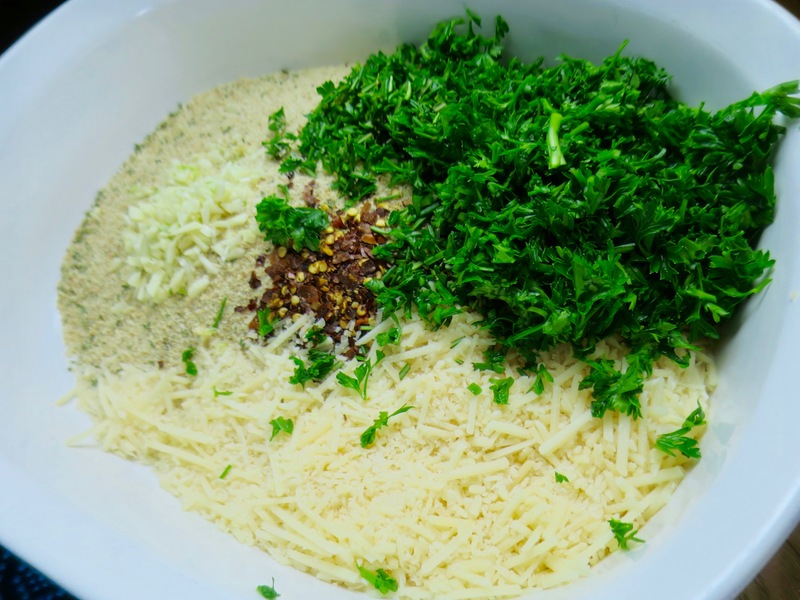 Mix together bread crumbs, Parmesan, fresh rosemary, parsley, garlic, and red pepper flakes together. Place bread crumb mixture into a third shallow bowl. 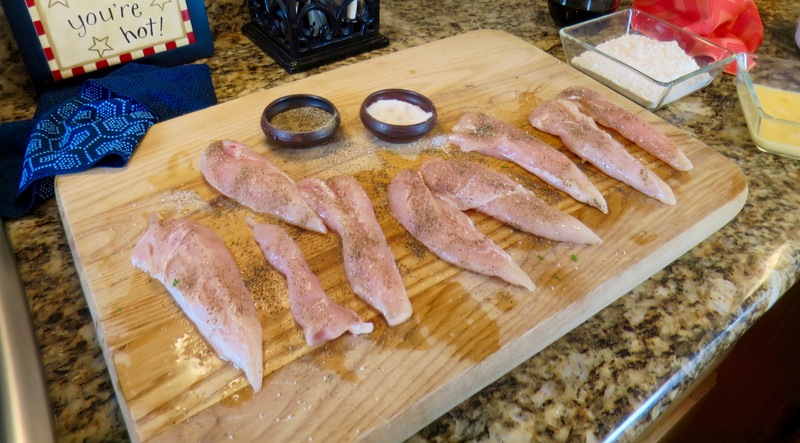 Season chicken tenders with salt and pepper. 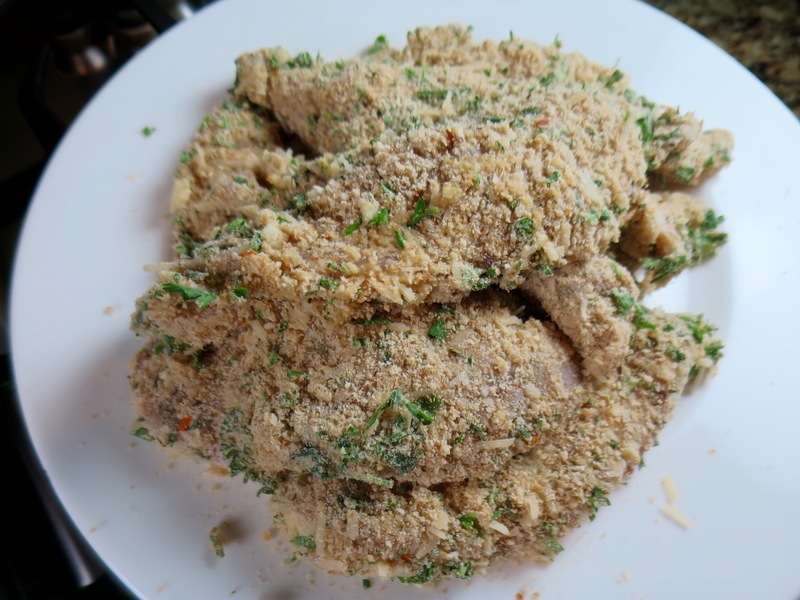 Dredge chicken in flour, then egg mixture, and finally the bread crumb mixture. With each chicken tender, fully immerse into each bowl to throughly coat with flour, egg, and bread crumbs. Set chicken aside. 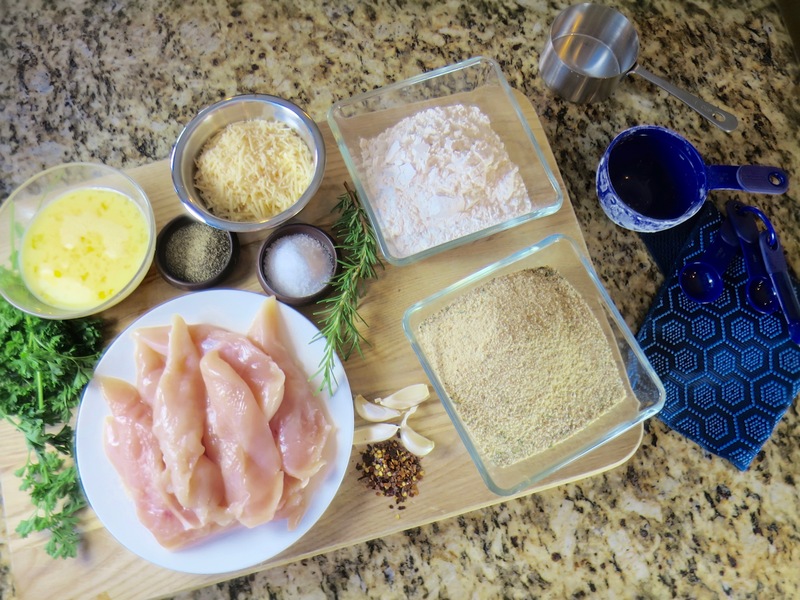 Chicken can be fully prepared to this point, covered and refrigerated to be fried later. I will often prepare this ahead if I am making up a large batch. If you refrigerate, let chicken come to room temperature before frying. Heat olive oil in a large frying pan. Cook tenders 3-4 minutes and then turn and cook for another 3-4 minutes. Cook until golden brown and cooked through. 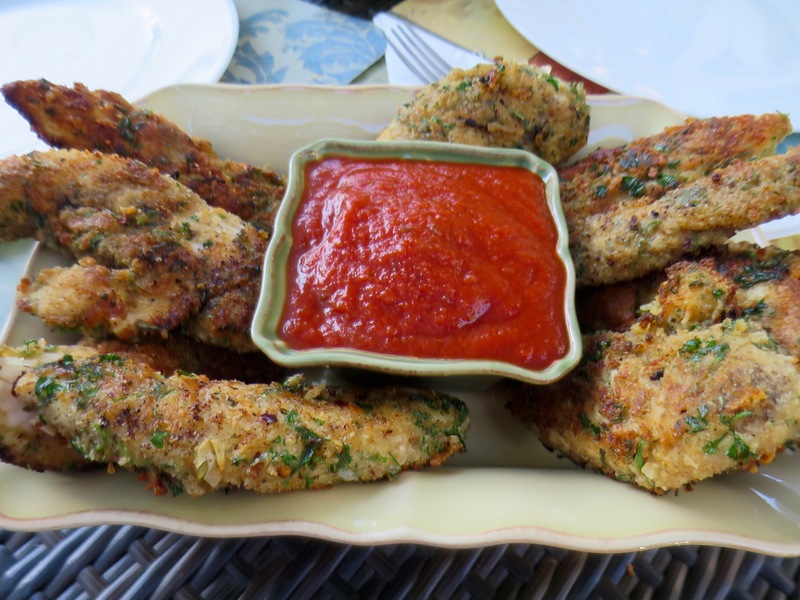 Serve chicken tenders with marinara sauce for dipping. 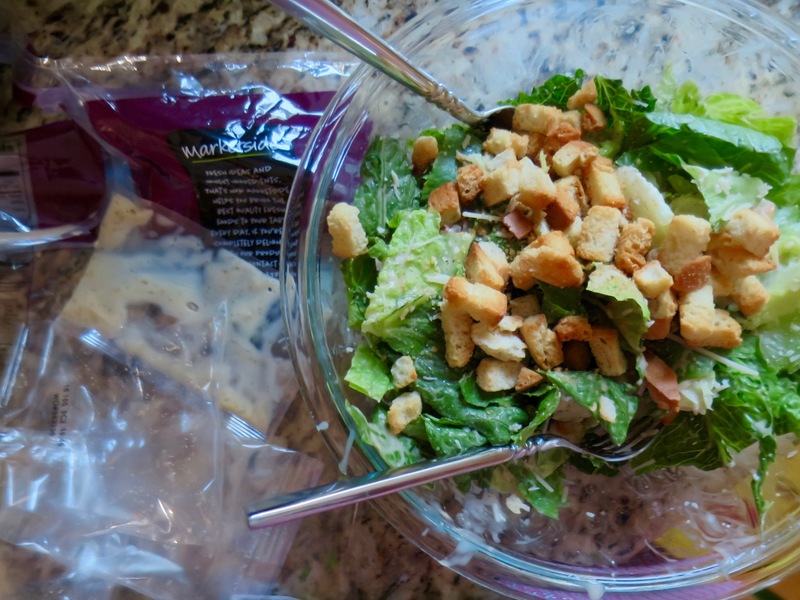 To make this a delicious dinner toss a caesar salad and cut up some cantaloupe. Such a delicious dinner. One that the kids and grown-ups equally love! And I love having a clean kitchen! Thanks, Scotch-Brite! Speaking of my kitchen, as you know I am currently purging and reorganizing all the drawers and cabinets in my kitchen. I just revamped the space under my sink. 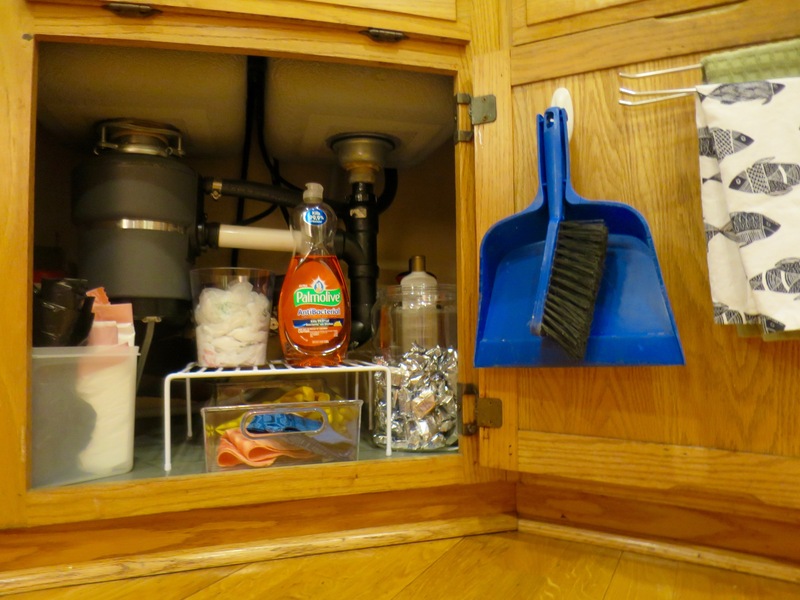 My under-the-sink cabinet is a bit tricky because my sink is placed in a corner counter. The space is awkward at best. I started by clearing everything out! Disposing of what was not absolutely essential. I then scrubbed the cabinet bottom and laid out a plastic cabinet mat. I cut this to size. Getting into the back corners of my cabinet is a bit hard on the knees! But I got to the far corners. Because it is so hard to get behind the items in the front of the cabinet, I decided to place three shelves – two tucked back into the corners and one right up front. I placed a pull-out clear bin under the front shelf, but the back shelves are there just to raise items up so that I can better reach them. 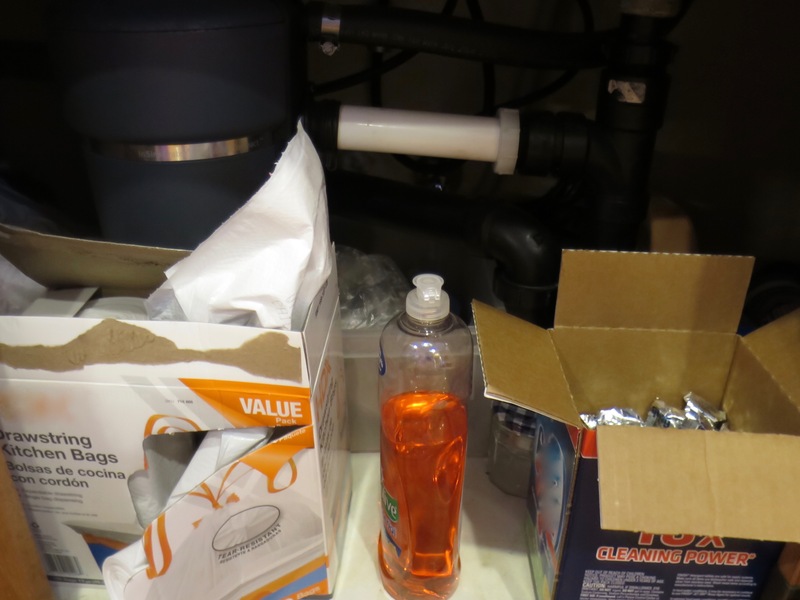 My next step was to go through my cabinets and the garage looking for plastic containers to house many of my kitchen cleaning supplies. I even took the garbage bags out of their original container simply because we need a number of different sizes and reaching in and around gets to be cumbersome. Having them all in one container will be easier. 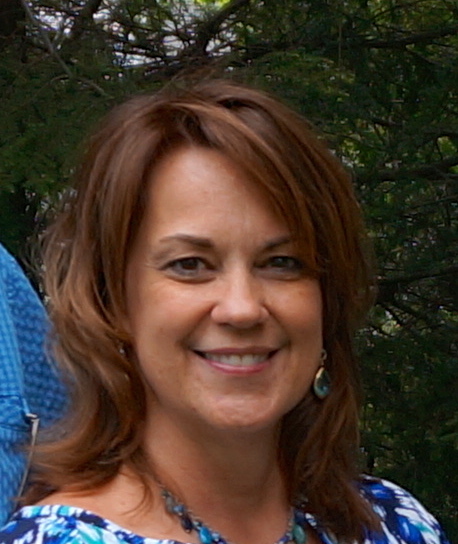 They still pull out just fine – I tested it out. Plus it just looks nicer. 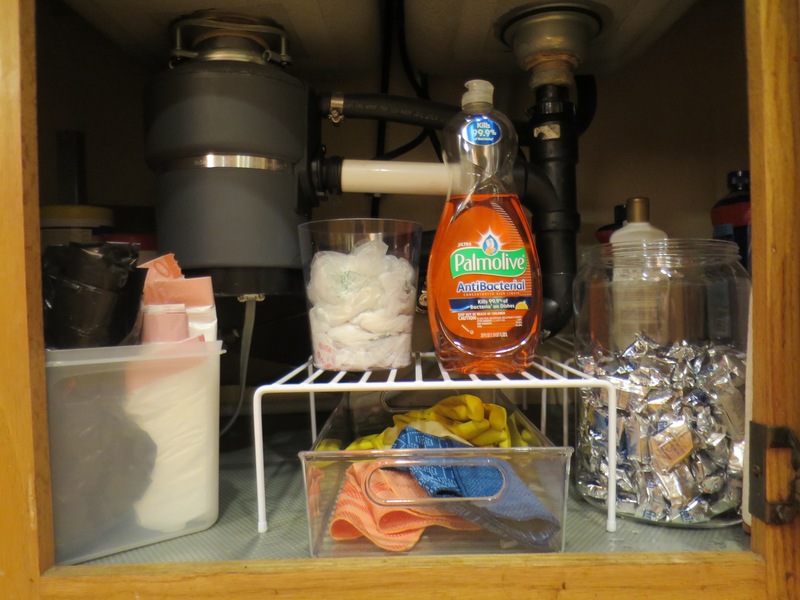 My new Scotch-Brite® Scrubbing Dish Cloths also came in handy cleaning out my under sink space! While these are new to the stores, a number of others are also discovering how they make stuck on messes so much easier to clean up! For kitchen inspiration, check out other great recipes and kitchen clean ups here: Scrubbing Dots Make the Difference. And here is the printable recipe for you! Be sure to save this one – you and your family will LOVE it! 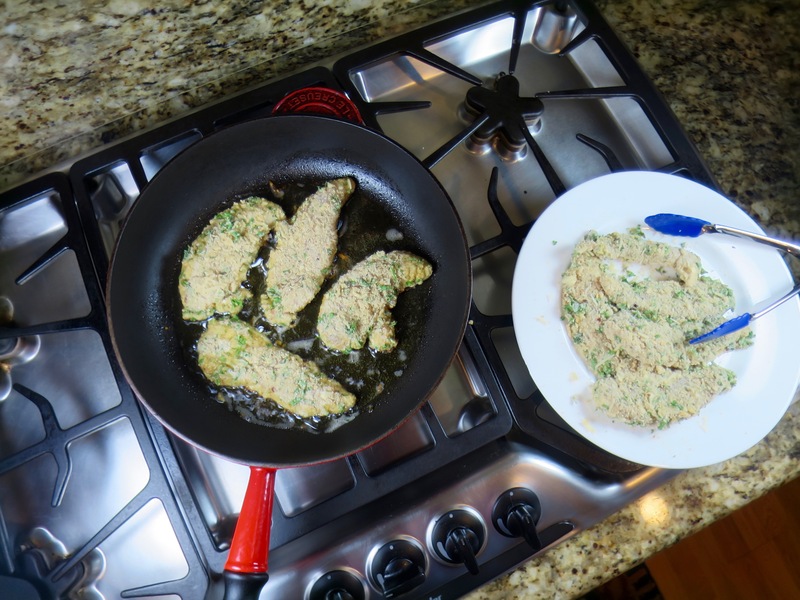 Dredge chicken in flour, then egg mixture, and finally the bread crumb mixture. With each chicken tender fully immerse into each bowl to throughly coat with flour, egg, and bread crumbs. Set chicken aside. What is one of your favorite “messy” recipes? I’d love to hear about it! Oh yum! These look delicious. 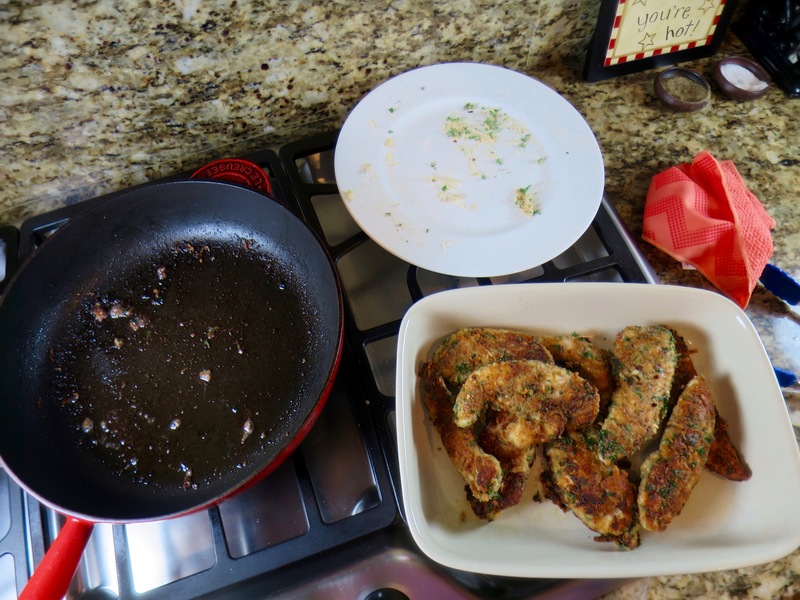 We love chicken tenders in our house and this looks so delicious. 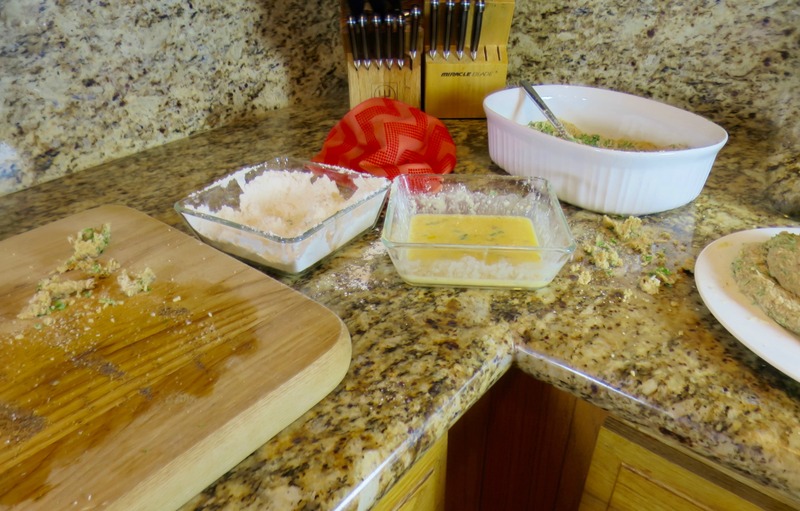 I will have to try for dinner soon…plus I love the easy clean up. Those chicken tenders are perfect for picky eaters like my son. 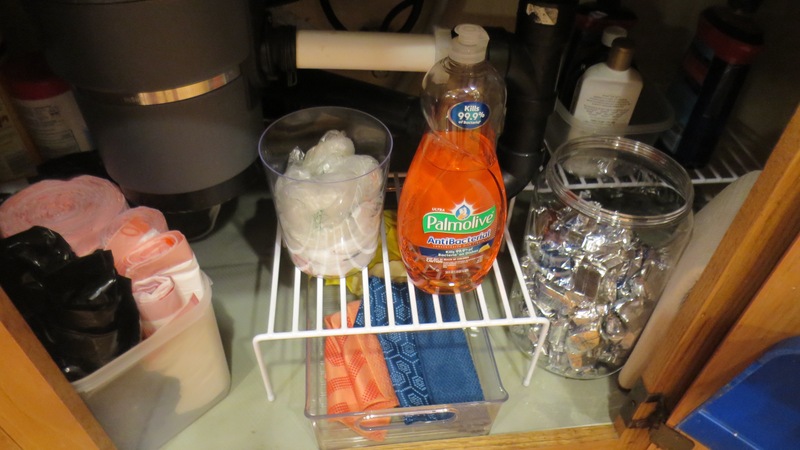 I am a stickler for having a clean kitchen too so I love those Scotch cleaning products to have on hand. This looks SO YUMMY! I love that these help you scrub your pans without hurting your arm. LOL. I’ve never made my own chicken fingers but these seem easy enough. This looks delish! Those towels are awesome! I have a few of them and they make clean up a breeze! I hate sticky pans after I’ve made a good meal. These look like they would really scrub your pan well with both sides. Love it! Oh man these look and sound just delicious. 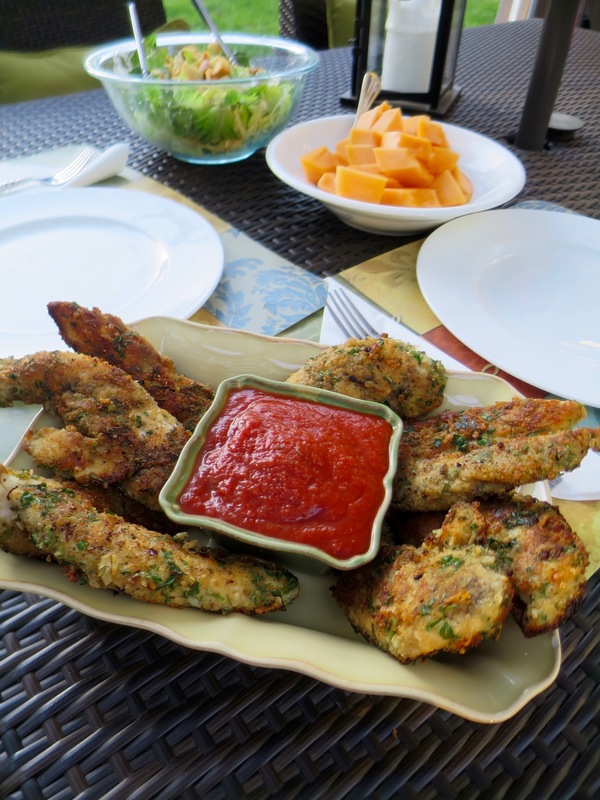 I love making my own chicken fingers/tenders and would love to try these. Just looking at them I know they’d be a huge hit in my family! These sound so delicious! You’re right, chicken tenders make such a mess! I’m never prepared for how messy it is, so thanks for the heads up! This sounds like a recipe that my kids and I will enjoy! I would love to make this for dinner probably next week! It’s easy to make and it’s not messy! This is a dinner my kids will LOVE! I pinned this to try 🙂 ps- I have kitchen envy!! Love your granite counter, gas cook top, & CLEAN kitchen!! Can’t wait to try the recipe too!! What a delicious and messy meal. I am glad to hear clean up was easy and I’ll be over fro some leftovers. If only I could reach through my screen and grab one of those tenders!! They look great. Mmmmm! Those sound seriously delish! My kids would gobble those right up! I will have to make them. I so understand your concerns about messing up the kitchen. I tend to fry on the burners of our gas grill – they are high output and I can hose away the mess. Your kitchen is wonderful – Mine is efficient but small. Can I come cook with you?? ?